Review: Sylvester Stallone plays the tough guy again, this time guided by the hand of Walter Hill, an experienced director on action movies, such as “The Driver”, “The Warriors”, “Southern Comfort” or “48 Hours”. “Bullet to The Head” is weak in many aspects and heavily clichéd, adopting a rough posture that had good results in the final 70’s and throughout the 80’s, but which no longer works. 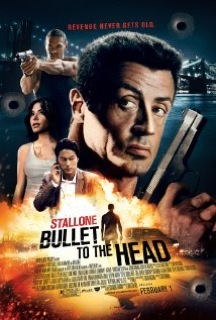 The plot consists in an unlikely and quite sentimental cooperation between an expert hitman (Stallone) and a young cop (Sung Kang), after members of a gang have shot their partners. Beyond the flat story, sloppy dialogues were used, where we can hear about tattoos or popular phrases such as: ‘guns don’t kill people, bullets do’. It even tried to make some humorous considerations about modern cell phones, or put some thrill with the kidnapping of Stallone’s only daughter, but everything was in vain. The choreographed fight scenes along with the final moments seemed too fabricated to impress, while the performances were drab. Totally outdated!